I had been plagued by the dreaded "stop, start, stop start" problem with the floor layout and inquired about this problem on this great forum and was told this would stop when I had secured the track properly on a train board. Well, I planned and researched how to build my first train board and I've been working on it a couple weeks on and off and thought I was almost ready to begin using it but after today I'm not so sure. I'm having very frequent "stop, start" glitches, as bad or worse than when the train was on the floor. The area around the 1122's is particularly bad but the engines will stop then start again anywhere on the layout, not just near the switches I have the 3 rail track lying on WS Road Bed foam and the joints between each piece of track are pulled tight and held together using zip ties pulled through and connected on the underside of the foam board and a sheet of Luan that supports the foam (along with some underside bracing). FYI, I ran out of track so I do have a couple of the 1122's just being used for straightaways, the curved track is not connected to anything since I need another switch and about a dozen pieces of track to complete the design I had selected. Does anyone have some insight about what's happening here? First step is to get rid of those 1122's, but if you are determined to use them, get yourself a digital multimeter with a continuity checker. Check for dead rail or a drop in voltage... you may have some bad pins. Could we get some overhead picture views to help you out? I was afraid the 1122's might be the "weak link". Are there modern switches than may be used that will work with old timey 3 rail? Here are a few photos as requested. How many power connections do you have to the track, from the transformer ? I was afraid the 1122's might be the "weak link". There's nothing inherently wrong with 1122/1122E switches. I have 24 of them on my O-27 layout. If this is your only track power connection, this is the primary problem. Actually, I have two power connections, the one that you circled on the inner loop and another one on the outer loop. Looks like you have 18 gauge speaker wire. The crimped on rings look a little large as far as the size of the hole. I'd suggest for starters up grading the wire size and make sure you have a solid connection to the track. Wires solder fairly easy to tinplate track. Yes, it is speaker wire but I thought it was 14 gauge. Should I remove the speaker wire and go with some stranded 14 gauge? Will any 14 gauge do or is there a particular type or brand recommended for trains? You are also correct about the crimped rings. They are too big for the bind posts so I have to make sure one of the edges is snug under the knurled nut at all times (certainly not the best set-up). I like the rings but was not sure where to find ones that were designed to fit the bind posts, both on the transformer and on the lockons. Where would I find the correct rings? Thanks. Your track is O27. 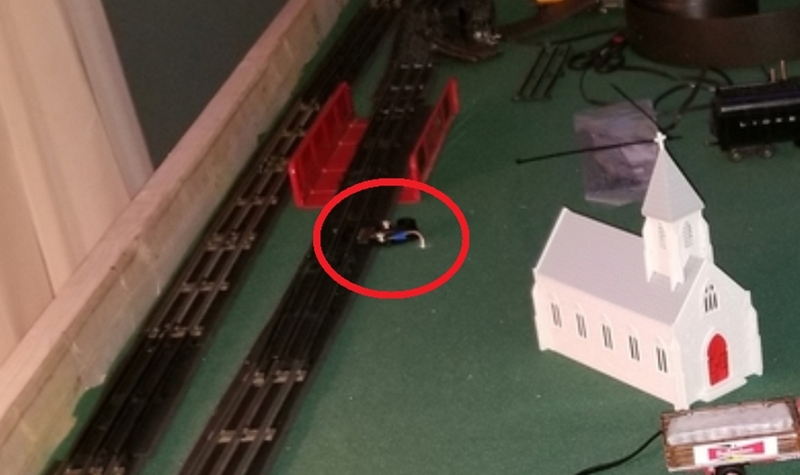 I think the lock-on (power feeder clip) in your pictures was designed for the taller O gauge rail. If the lockon doesn't snap on all the way and make good contact with both the outside and center rail, you won't have reliable operation. You might be able to increase tension by bending the piece of metal that clips to the center rail. Adding a couple more connections can't hurt, but that's a band-aid work around to poor track joints. Make sure the sockets at the end of the rail where you insert the pins are nice and tight. If they're loose and sloppy, the loco will slow down or stop near that section because it's getting less power. A weak joint can sometimes even feel hot to the touch! You can try reshaping loose joints with careful use of needle-nose pliers. If the sockets are so wide or badly distorted that they won't hold a pin snugly even after adjustment, then you might need to replace that section of track. If the joint is tight but still doesn't conduct electricity reliably, try cleaning out the pin sockets with a pipe cleaner soaked in alcohol. You should also pay attention to the loco wheels and pickup rollers. If the rollers are badly grooved or the springs are weak, you'll see sparking and stalling. Likewise if the loco wheels are dirty. A quick way to clean the wheels, is run the loco upside down and lightly hold an alcohol-soaked, lint free cloth on the wheels. A lot of grease will come off on the rag. Be careful not to get cloth fibers caught in the gears. Any sparking should be reduced after several laps around the track. If the stalling doesn't improve it could be a loose wire, worn motor brushes or brush springs. Replacement parts are available. If there's heavy sparking, the motor might be drawing too much current. That can be a sign of mechanical problems like something binding or rubbing in the gear train. The 2023 and 2046 are both excellent locos which will run great on O27 track, once everything has been gone over and brought to good working condition. Good luck! Creep, coast, and pull. We're not talking about cold fusion here. That's not enough. If you have another feeder/lockon every 4-6 joints with that old track you will noticed a marked improvement. Your track is O27. I think the lock-on (power feeder clip) in your pictures was designed for the taller O gauge rail. Nope. "O" or O-27, they all work fine - CTC, LTC, UTC, Marx, K-Line, Flyer, MTH 11-99021,they all work fine. Some years of 0-27 used hollow pins. When these get old they rust from the inside out. They have a small seam and can be crushed by pliers. Remove these from center rails and use solid pins there. (bad hollow can get red hot if thin enough. The outer rails matter too, just less so. Outers combined have twice as much pin metal as the center rail has. You need more metal to flow more amps. You may have an engine or car wire(s) shorting. Check the tender roller wire at the terminal, the hold down tab(if) and chassis wire hole. Etc. etc. The cleaning of the armature gaps and brushes can improve low end performance, lower the voltage needed to move, run cooler, and prevent some stalling. Really dirty wheels may need to be scraped too. Sometimes the grime appears to be steel but isn't. Try a small screwdriver blade. If you see silver metal to metal scratches(light) you are maybe clean enough for alchohol or naptha on a rag or Q-tips. Thick gunk takes forever with solvents alone sometimes. I test scape, then decide. 14g wire should be fine really if the runs aren't real long(chart). Stranded would be better but not by much. Speaker wire tends to have a softer less protective insulation, but the AWG rating is the bottom line... read the wire. It's specs are often printed on it if you look REAL close . (tons of charts and free calculators are a search engine away... X amps at X volt at x ft long = mininum wire gauge)(voltage isn't usually an issue, most are rated far above our low volt train stuff). Bigger wire is better for power delivery. I wire to handle my transformers max output. Smaller wire than that needs a fuse to prevent frying wire during heavy shorts. Check your 14g against all that. Finally, some diesel rollers can fall off of 0-27 center rails in curves. I have two like this and simply limit how far the arms can drop with a tiny zip strip. They would drop low, arm axle boss's tab shorting on the tie's tabs and slide back on the rail at rest, but now in neutral.....or reversed away from it. They also jammed the loco to a complete stop sometimes. Some years of 0-27 used hollow pins. I now have plenty of information about the possible causes of these stop start problems. 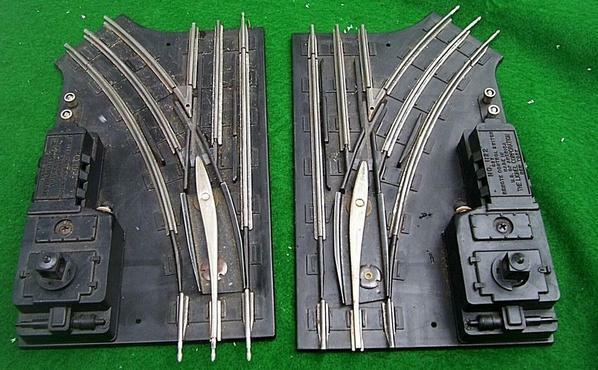 I never imagined that inherent defects in the I individual pieces of track and connecting pins could be the culprits. I thought that merely having tight track to track connections would be enough to ensure a smooth running train. Boy was I wrong. I have primarily a collection of 1950's era track that I inherited plus a dozen new pieces I purchased separately and four 1122's I bought on eBay. I'm tempted just to replace the old sections with new ones rather than troubleshoot the track to try to identify microscopic cracks, shifted insulation, bent and loose pins, and other defects that may be causing shorts. Too much time and trouble as far as I'm concerned . I want to begin enjoying my new layout not spending a lot of time trying to fix it. Both my 2023 and 2046 Hudson are clean and both have had complete professional overhauls so I'm certain they are not the problem. The 1122s remain a concern however. Today I observed the 2046 screech to a halt after traversing one of them and I've seen this happen before with my other 1122s. These episodes do not inspire confidence. Can you tell us what Transformer you are using. I briefly read over the above post and unless I missed it there is no mention of what transformer you are using. If you are using a low wattage transformer it may be overheating the circuit breaker causing it to trip or the breaker may be weak. I remember when I was still a kid we had a Lionel 2056-2046w engine and tender freight set. It came with a 1033 transformer. We had another set that had a 1053 transformer. The 1053 would keep tripping the breaker and resetting trying to run the 2056. The 2056 is the same motor as the 2046 you have except without the magnatraction. As Tim The Tool Man always said. You may need More Power. It's a 1033 and as far as I know it should be adequate for my small layout. I went digging through some service docs. The switch problem could the frog cover. The wheels hit it and short out. See photo and service document excerpt problem #6 and correction. (attached) Remove it. It is not needed. There is also a difference in the frogs. You can use the service docs to help you resolve any further issues with the 1122 switches. As Rob said, no problems once you get to know them and give them a little tuning where needed. Go to Harbor Freight and get an inexpensive volt/ohm meter if you don't have one. It's needed to play with electric trains. Thanks a lot Moonman and to all who have tried to help me. I had read the term "frog" before but never really knew what part of the switch was being referenced. I read the Service Doc #6 as suggested so I simply remove the metal "frog" cover and that should correct the problem? The service doc mentioned something about replacing the cover with a different part but you said the cover is not needed so I guess I won't worry about that. That's easy enough. The switch you selected to comment on (marked with the large "3") is the actual switch I was describing when I said the loco "came to a screeching halt" above. It was part of my inheritance (not from eBay) and has never worked properly. 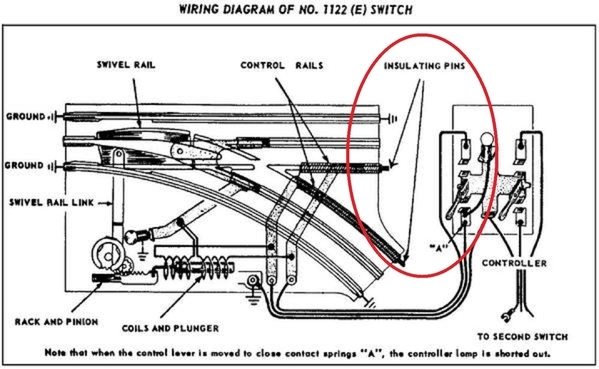 I read somewhere that fiber pins are needed for some but not all 1122 switches and in fact fiber pins used incorrectly could cause derailments. I should probably investigate this issue too. All of 1122's should have insulating pins in the control rails. Under the cover there should be a metal frog. if not, that is the part that is needed. I believe there is a diagram to indicate where the fiber pins should be. The other important item is the binding post with metal under it is the Common for the controller wires. WINHUND42, The use of vintage track should not be a problem as long as the joints are clean and tight. My layout uses all Gilbert American Flyer track, the newest is 60 years old, it has some corrosion which is not unusual for the age. One thing I found when doing modifications to the switches and having to disassemble much of the track, when I put it back together I added a drop of Rail Zip to each of the pins. This made a world of difference in the continuity of carrying the power through the rails. I now have less connections to the power source but better performance over the entire layout. Do both engines exhibit the problem? Adriatic..I appreciate your comments regarding 1122s but am having a hard time understanding precisely what you mean. My photo spread above includes three out of four of my switches. Perhaps you will look at these photos to possibly identify which need pins and which don't? I am sure that you will be very happy with the Rail Zip, worked great for me. Adriatic..I appreciate your comments regarding 1122s... ...look at these photos to possibly identify which need pins and which don't? The left hand switch uses the same rails(the short, inside ones) in mirror orientation. Also, be sure not to let any part of the train park on those control rails(with the pins) of the switch while the track power is on as this can overheat the switch motors(solenoids). I read some commentary about Rail Zip leaving residue that may be picked up by locomotives. Has this been a problem for anyone? When I receive my bottle, I had intended on using the substance on the pins only which I don't imagine would be subject to build-up since are inserted into their respective holes on the adjoining track. It sounds to me that some model railroad owners "paint" their tubular track with it and this practice could result in fouling of the locomotives, if in fact the reports of this problem are true. Perhaps Ray has some insight since he seems to swear by the product (as do many others in various reviews I've seen). I would not paint my track with any lubricant, Rail Zip is a conductive oil. For cleaning my track l use denatured alcohol, l also have a home built track cleaning car which uses a foam paint roller set at about a 30 degree angle and runs dry to lightly abraid the track to remove surface dirt. Thanks Ray. That's makes sense. I too use denatured alcohol to clean my track. Waiting for the Rail Zip2 and an additional lockon (as suggested by Rob above) to arrive in the mail (they must be coming from Azerbaijan it's taking so long). All of my 1122 (E)'s have fiber pins in the correct locations. I swapped a couple of them and the train seems to be running better but still having problems. I plan on coating the 1122 pins with the Rail Zip (and the stop/start and slow areas on the track of course). Should I coat the fiber pins too even though they are not conductive or is that not a good idea? Also, my tracks are tight as they are held together with zip ties but I have yet to figure out how to hold dowh the switches or is that not necessary? No, don't coat the fiber pins as they are isolating pins, you need the insulating pins in the positions indicated on the instructions. If you possibly can put a drop of Rail Zip on all of the metal pins on the layout to help with electrical continuity.